Hannes Egger’s Everything must be doubted is a minimalist, interactive installation which takes visitors on a guided tour of an imaginary exhibition. 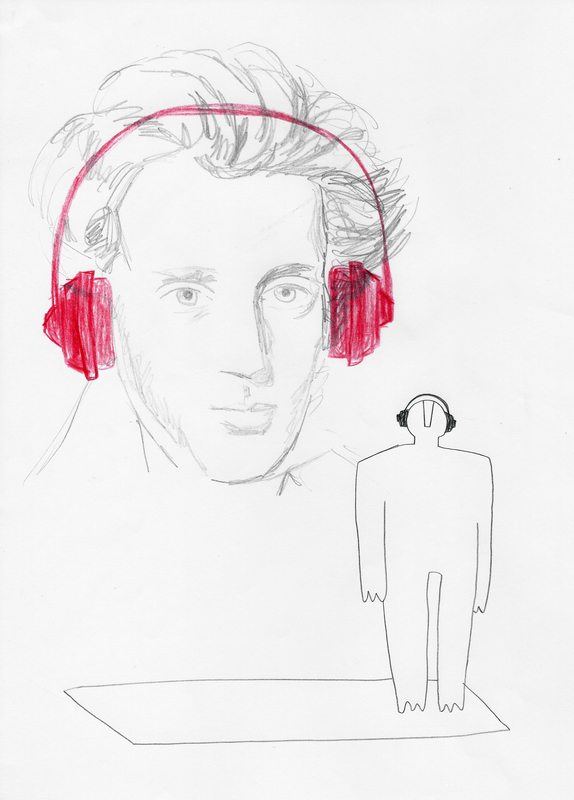 They wear headphones and walk round the exhibition area following the guide’s cues. They are made to stop in front of a range of symbols marked on the floor, and are told how to move and what to imagine. In the work De omnibus dubitandum est Søren Kierkegaard tells of his own childhood when his father forbade him to go out of doors for fear of contact with the world. To make up for lack of direct experience, his father would tell him a host of stories as they paced the length of the home corridors. Kierkegaard thus saw extremely little of the world in his childhood, but his father’s storytelling prompted a special degree of imagination. In this installation Hannes Egger invites the audience to let themselves go and dare to trust their own imaginations, whilst complying with another person’s guiding thoughts. For a moment they step out of active life and give way to a contemplative life under the complete guidance of an outsider’s ability to communicate.